It is a bridge in which the main beams comprise girders in the shape of a hollow box (rectangular or trapezoidal shape). The box girder normally comprises either prestressed concrete, structural steel, or a composite of steel and reinforced concrete. A box girder is formed when two web plates are joined by a common flange at both the top and the bottom. The closed cell which is formed has a much greater torsional stiffness and strength than an open section and it is this feature which is the usual reason for choosing a box girder configuration. To reduce the dead load, unnecessary material is removed out of section, this results in the shape of box girder or cellular structures, depending upon whether the shear deformations can be neglected or not. Span range is more for box girder bridge as compared to T-beam Girder bridge resulting in comparatively lesser number of piers for the same valley width and hence results in economy. Box girders are rarely used in buildings, but they may be used in special circumstances, such as when loads are carried eccentrically to the beam axis. Box girders can be universally applied from the point of view of load carrying, to their indifference as to whether the bending moments are positive or negative and to their torsional stiffness; from the point of view of economy. Box girders are more suitable for larger spans and wider decks. Economy and aesthetics further lead to the evolution of cantilevers in top flanges and inclined webs in external cells of box girder. The dimension of the cell could be controlled by prestressing. As the span and the width increase, the beams and bottom slabs are to be tied to keep the geometry which in turn leads to evolution of box girder. It can be used for spans up to 150m depending upon the construction methods. Cantilever method of construction is preferred most. Box girder bridges may be cast in place using falsework supports, removed after completion, or in sections in case of a segmental bridge. It may also be prefabricated in a fabrication yard, then transported and installed using cranes. Another method of box girder bridge construction is the incremental launching. Under this method, gantry cranes are often used to place new segments onto the completed portions of the bridge until the bridge superstructure is completed. 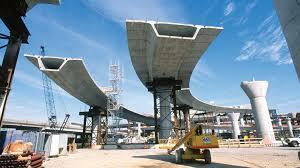 It can cover a range of spans from 25m up to the largest non-suspended concrete decks built; of the order of 300m. Single box girders may also carry decks up to 30m wide. For the longer span beams, beyond about 50m, they are practically the only feasible deck section. Below 30m precast beams or voided slab decks are more suitable while above 50m a single cell box arrangement is usually more economical. Single cell box girder cast-in-situ are used for spans from 40m to 270m. The box arrangement is done in order to give aesthetic appearance where the web of the box would act as a slender appearance when combined with a slim parapet profile. Single box arrangements are effective for both the longitudinal and transverse designs, and they produce an economical solution for medium and long span structures. Single box deck is constructed span-by-span, using full-height scaffolding or trusses, or as balanced cantilever using form travelers. This could be particularly important for medium length bridges with spans between 40m and 55m. It is used for modern elevated structures of light rail transport. Box girders are used for the construction of a cable-supported bridge, curved bridge, and footbridges. It is rarely used in buildings, but they may be used in special circumstances, such as when loads are carried eccentrically to the beam axis. It is an economical and an aesthetic solution for the over crossings, under crossings, grade separation structures and viaducts found in the modern highway system. 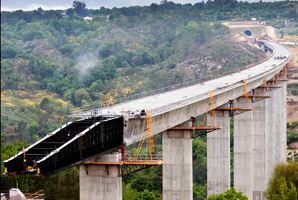 In case of long-span bridges, a large width of the deck is available to accommodate prestressing cables at bottom flange level. Interiors of box girder bridges can be used to accommodate service such as gas pipes, water mains etc. 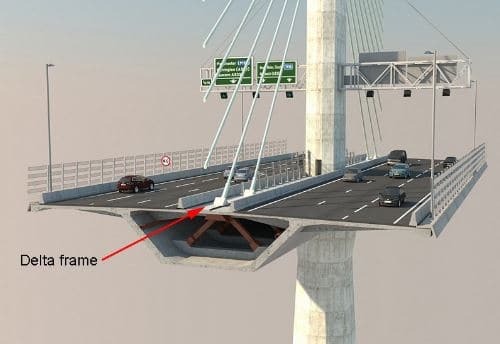 For large spans, the bottom flange could be used as another deck as it accommodates traffic as well. The maintenance of box girder is easier; interior space is directly accessible without the use of scaffolding. It has high structural efficiency. Box girder bridge has a great resistance to torsion. This is specifically beneficial for a bridge that is curved in plan.